I love almond butter and baking with it is such fun. Apart from the fact that its really easy to bake with, and the taste that almond butter imparts to the baked product, its also a great and healthy alternative to butter. Last summer I baked Almond Butter Oats Cookies and they turned out delicious. Since then I have done a lot of baking and cooking using almond butter and been very happy with both the taste and quality of the product. In this recipe, I used almond butter to enhance the taste of the cinnamon raisin filling as well as to ensure a more moist filling. It worked very well. 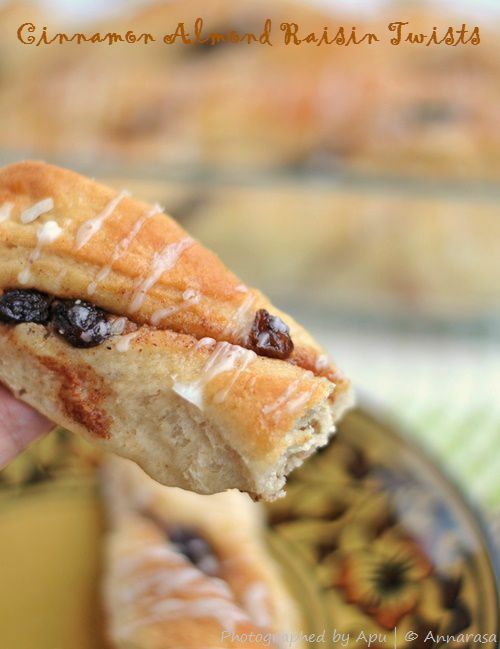 We loved these Cinnamon Almond Raisin Twists. They are not too sweet and so good with milk. In fact they make a perfect breakfast! Sift the flours together with the salt and sugar. Chop the into small pieces and rub it into the flour mix using your fingers. Warm the milk, add the yeast and allow to proof for 5 minutes. Whisk the egg, pour it into the flour mix. Next add the proofed yeast, and mix the whole to make a soft dough. Place in a greased bowl and allow to double about 2 hours. Now prepare the filling by melting the almond butter. Add the sugar and cinnamon to the almond butter. Blend well. In a separate bowl, melt the 2 tablespoons of butter and set aside. Place the raisins with 1/8 cup water in a microwave safe bowl. Microwave for 1 minute. Allow the raisins to sit in the water for another 5 minutes. Then drain the water out. Once the dough is proofed, punch it down and roll it into a 15 inch by 8 inch rectangle. Brush about half the melted butter over the rolled out dough. Top with the prepared filling and sprinkle with the raisins. Fold in half from top to bottom, then cut into 12 strips. Twist and stretch each strip, place on a prepared baking try about 1" apart. Brush with remaining melted butter. Cover with cling film, leave for about an hour or until doubled in size. Bake at 350 F in a preheated oven for 12-15 minutes or until golden brown. Prepare glaze by whisking with 2 tsp warm water. Brush onto the twists. Enjoy warm or cool completely before storing in an airtight container in the refrigerator. Warm for 10-15 seconds in the microwave before serving.